From Laurence Olivier and Greer Garson to Matthew Mcfadyen and Keira Knightley, I've seen every film version of Pride and Prejudice there is. I've analyzed every cast, decided who my favorites are, and - like most people - settled on BBC's Pride and Prejudice starring Colin Firth and Jennifer Ehle as the best version. That is, until I saw Pride and Prejudice and Zombies. Within the first fifteen minutes, the cast for PPZ blew all the others away. I have many reasons for adoring the film, and I'll be discussing those in a collab another time. For now, I want to tell you why PPZ's cast is my favorite Pride and Prejudice cast in film history. Lily was a flawless Lizzie. With her unconventional beauty, flashing eyes, and abundant sass, Lily brings Lizzie to life better than ever before. Not only is she an excellent actress, giving fresh life to all the dialogue we know by heart, but she's convincing as a badass zombie-killing warrior-woman. She looks like she knows what she's doing. You want her to be happy, to find true romance - but you also want to shout, "HECK YEAH" as she decapitates undead hordes with her Shaolin training. Colin Firth is usually upheld as the epitome of Mr. Darcy Perfection, and I was slightly skeptical when I heard of this particular casting choice. While I loved Sam as Diaval (Maleficent), I couldn't really see him as Mr. Darcy. Then again, I reasoned, I hadn't been able to envision Lee Pace as Thranduil, so I might as well be open-minded about the whole thing. Sam Riley proved himself a perfect Darcy within the first five minutes. Young, brooding, and lethal, he inhabits the role of socially-awkward-yet-broodingly-attractive Darcy like no one has before. His micromannerisms really make the character - from skeptical eyebrow raises to amused mouth twitches, he makes Darcy fun while still holding to the character's original intensity. I've never enjoyed interpretations of Wickham like I enjoyed Jack's. Handsome, passionate, and devious, Jack is truly enjoyable to watch as Wickham attempts to steal Lizzie's heart - and overtake the world at the same time. You want to hate to love him even when you know he's a scoundrel, and you love to hate him once his true colors are revealed. He plays the kind of villain you want, in your heart of hearts, to root for - but he's just evil enough that you also want to see him skewered on the end of Darcy's sword. It's a perfect balance. We all know and love Bingley's cheerful, optimistic, and friendly personality, but Douglas Booth brings Bingley to life in a new way. Whether he's falling awkwardly in love with Jane Bennet or falling over his own feet, Douglas turns Bingley into a lovable young man who is equal parts graceful and clumsy. He's head over heels - both figuratively and literally. He's the human version of an eager, loving puppy, and you can't help but want to bring him home. She wears an eyepatch, is the richest woman in England, and has single-handedly slain fifty thousand zombies (probably). She's the first version of Lady Catherine you don't despise. In fact, you love her. Lady Catherine is awesome. We all know Mr. Collins is a bumbling buffoon…but this may be the first time he's ever been a lovable bumbling buffoon. He's not mean-spirited or greedy like his predecessors - he's just vaguely moronic. I've never actually wished Mr. Collins happiness until Pride and Prejudice and Zombies because I've never liked him before - or enjoyed his humorous attempts at life so thoroughly. In short, Matt is strangely lovable and completely hysterical as Mr. Collins. We all know the Bennet sisters by heart - we know Mary is the stodgy bookworm , Lydia is the flighty, thoughtless flirt, and Kitty is the airhead who blindly follows where Lydia leads. Not so in Pride and Prejudice and Zombies. This is the first time in cinematic history where you legitimately like all the girls - and where each sister can hold her own against a zombie horde with admirable skill. Also, I bet you've never seen the sweet Jane Bennet stomp her heel into a zombie face before. The casting choices for this movie were sheer perfection. I am legitimately uncertain as to whether I'll be able to truly enjoy any other version of Pride and Prejudice again - at least I know I won't enjoy them half as much. The cast of young actors brings fresh twists and breathes new life with to common portrayals of well-known characters, and I applaud each and every one of them. 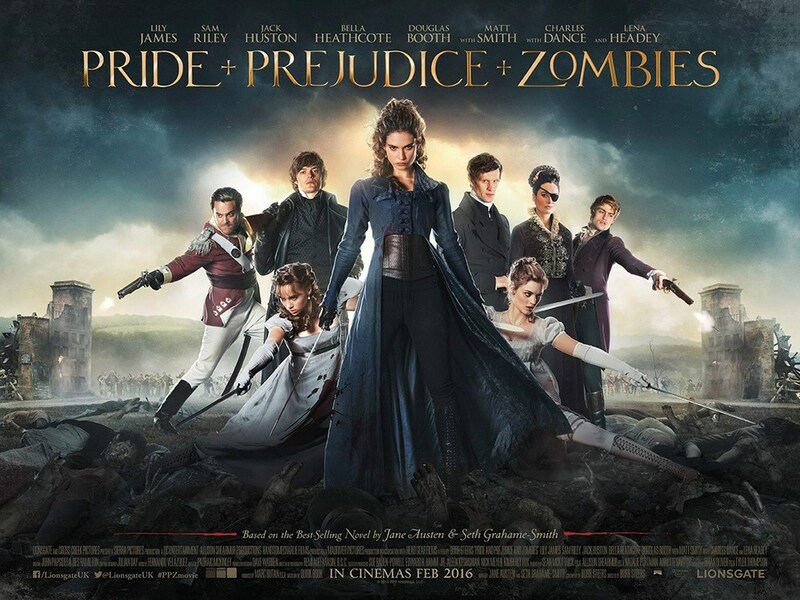 Have you seen Pride and Prejudice and Zombies? Do you have a favorite cast for the story? I AM SO EXCITED TO SEE THIS MOVIE. And I am most excited about Mr. Darcy. Because I knew Sam Riley would be great at it. But also I think Lena Headey and Lily James will be awesome.